Day 7: M wanted to go back to Pipe Springs to hear the tour we’d missed the day before. So we stopped in at Kanab for groceries and ice, and then did the tour of the house: “Winsor Castle.” Cool. 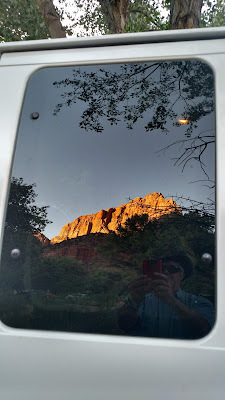 Tonight we had reservations at Watchman Campground in Zion, so we enjoyed the drive from Kanab into the park—absolutely beautiful—and got set up in our campground. We had been warned that Zion would be hot and crowded. It was both. But we had shade in our campsite, and found a few ways to keep cool. To get familiar with the park, we took the shuttle ride (the only vehicles allowed in Zion Canyon, really) all the way to the end and back. Well, as we got back closer to the campground, we decided to get of the shuttle and hike the easy and flat Pa’Rus trail two miles back to camp. This was wonderful. Late afternoon, it was a quiet and lonely walk through Zion Canyon. Only two miles, and full of views. The only bad part was that by the end, my knee was killing me. Grrrr. It was hot, it was dry, and I was probably dehydrated as well, which didn’t help. A quiet dinner and night in camp ended the day. Day 8: Today we were going to be ambitious, in our condition, and hike the Emerald Pools Trail. This was perfect for us, because there were three pools, and we could turn back whenever we felt like it. M was wearing her protective boot for this, which got her lots of praise from every hiker we met. And we did manage to hike to all three pools, even the third one, which took a bit of scrambling on boulders. On the way out, we hiked the Kayenta Trail, which gave fabulous view up and down the canyon. Really cool. And both of us survived the hike without further damage. So far, so good. We got back to the visitors center about lunchtime, so we ate down by the river and chilled our sore limbs in the water. That made a huge difference. In the afternoon we took a nap in the van, then washed up a bit in camp, and finally walked into town (1/2 mile at most?) for dinner. Camping at Zion is pretty darn comfortable, if you can stand the heat! Day 9: This was going to be a recovery day for us. We took the shuttle up to the Weeping Rock Trail and hiked it---quite steep but very short—and basked in the dripping water off the ceiling of the alcove. Then back on the shuttle to the end of the canyon to see about the River Trail to the Narrows---but it was closed due to a rockfall. We walked along the river with the rest of the crowd until it came time to cross the river on slippery cobbles. Neither one of us liked that idea with our current injuries, so we bailed out and went back to the visitors center to each lunch by the river. It was 102. That afternoon we took a drive, up out the park and into the high country of the Kolob Terraces. What a smart move! The drive was wonderful, with great views in all directions. The weather at the top was at least fifteen degrees cooler. From there we drove back later in the day, dropped the van off at the campground, and took the Springdale shuttle further into town for Pizza. At the end of the day, we walked from the campground over to the petroglyphs (not marked on the road or map, but the visitors center staff is happy to share directions) and took a few photos before calling it a night. Day 10: Today we heard that the River Trail was open, so that was our first order of business. We rode the shuttle up along with everyone else, and then hiked the mile to where the trail ends and the river walk to the Narrows begins. We thought about it again, but the idea of slippery on a wet rock and tweaking our foot or knee convinced us that we would give this one a pass. On the way back to the shuttle stop, I noticed a huge bird circling over the canyon. Yep, it was a condor! Back at the visitors center, we walked to the “nature center” which was pretty disappointing. In the mid-afternoon we made our way to the river to soak our sore legs---and M went all the way in, bathing in her hiking outfit. Very cute. We took a nap, rested a bit before dinner and then ate in town again. Camping in Zion is civilized. Day 11: We left Zion fairly early, and we were hoping to camp at Bryce, so we wanted to arrive in time to score a campsite. That worked perfectly, and there were plenty of spaces available when we got there around 10:30. Our campsite was really great, on the edge of the campground, with nice shade and few neighbors. We then spent the day exploring Bryce without doing too much walking. We went to the visitors center, walked from our campsite in loop D to Sunrise Point, caught the shuttle there and rode it into town and back, then out to Inspiration Point (the end of the line in the park). He hiked to upper Inspiration Point (about a mile) and then continued to walk down to Sunset Point. Our legs were beginning to suffer, so we took the shuttle to the lodge, explored that a bit, then went back to camp and napped. In the evening, we drove into Ruby’s to buy ice and groceries, and ate at the buffet there. And finally, after dinner, drove all the way to the end of the scenic drive at Rainbow Point to watch the sunset. Day 12: After the trails yesterday, we wanted to rest today. M wanted a shower at the general store, but first we drove out to see Red Canyon, just a few miles outside the park. This is a BLM site, but really nice, and we walked two of the trails there---ending up with about 4 miles total—which was more than we expected to do today. We ate lunch at Red Canyon, then went back to camp to nap and do laundry and showers. A very pleasant and cool afternoon in the higher elevations of Bryce, after the heat of Zion. After dinner in camp we drove the scenic drive again to take in the sunset, but it was cloudy in the West, so our photos suffered…sigh. Day 13: Big day today, as we had decided that if we took it slowly, we could hike the Queen’s Garden hike and combine it with the Navajo loop for about 4 miles, and plenty of up and down. That worked perfectly, and both of us felt pretty decent after the hike. We drove to Rainbow Point to eat lunch, and take the nature trail to the Bristlecone Pine grove there. In the morning, when we had extended our campsite for one more day, we met Penelope, a cyclist from Canada. We shared our site with her and had a nice chat. IN the evening we drove back to the general store, and passed by a few prairie dogs that enchanted M. We also saw a couple of pronghorns here along the road. We loved Bryce---the cool weather, the lovely campground with plenty of space, and the wonderful scenery and hiking. Day 14: Today we were supposed to work our way towards Grand Junction, with a single night on the way in a campground somewhere. We had a hotel reservation there so that we could do an airport pickup, but now that was in Moab, not Grand Junction. We had made a reservation at Kodachrome State Park, but that would leave us with a long drive to Grand Junction…and it wasn’t the kind of place we wanted to spend a whole day. We stopped first to hike to Mossy Cave and see the waterfall, and then stopped in Cannonville at the Grand Staircase Escalante NM visitors center. From there we checked out Kodachrome: saw a few of the sights, let them know that we wouldn’t be staying, and headed East the legendary Highway 12 through Escalante. Wow! This was way better than we expected. Stunning vistas of slickrock for as far as you could see. Oceans of slickrock. Amazing. We stopped for lunch at the Anasazi State Park, where we visited the museum and ruins, and loved the local food truck, Magnolia’s. And as we headed up into the mountains above Boulder, Utah, we found a very nice campsite at Pleasant Creek, in the national forest about 30 minute’s drive from Capitol Reef. Lovely. And much closer to Grand Junction. Day 15: The next morning, we got up early and took the scenic drive through Capitol Reef. We drove down to the end of the road at Capitol Gorge, and hiked the trail down the gorge—but did not make the climb up to the tanks, as we were nursing our sore legs a bit after Bryce. But the gorge itself has some really nice petroglyphs. We ate lunch in the picnic area of the park, went into the Gifford House to buy cherries, pie, and salsa. The salsa was good. The cherries weren’t quite ripe, and the pie was raw. Hmmm. At any rate, it was time to drive to Grand Junction, where we stayed in luxury at the Springfield Suites---took warm showers, cleaned up, went out to dinner at Bin 707 Food bar (delicious local cuisine---really yummy) and slept in a real bed. Wow.